Welcome to Day 1 of an exciting blog hop. Thank you to Mdm. Samm (SewWeQuilt ) and to Carla (Creatin' In The Sticks) for inspiring us to expand our imaginations and sew. A wonderful selection "HANDMAIDS" fabric created by Quilting Treasures made working on these blog projects a pleasure. A perfect little runner for tea time break . There are so many neat characters in this fabric. I looked at this and saw a Scottish lady. She was calling for tartan. A ruffled fringe for framing and I have a new cushion. And hand-holding Handmaids rule on the pillow back. I created a mini quilt using the gentler colors. What started as a small lap quilt grew. The pieced back includes one of the original panels. I was not supposed to start another quilt but those designs just spoke "quilt". Hand quilting will be in this quilt's future. This picture was taken in -22 on a beautiful cold winter day after a blizzard. Thank you for visiting. A visit to other sewing rooms will provide more stitching delights. What a fun bunch of creations! Thank you for sharing. Beautiful projects. I love your min quilt. I really need to make a wall hanging for my Sewing room. (Studio) I am going to start calling it a sewing studio. Sounds so "grown up." Your mug rugs are very sweet. I really like that design. Thank you for hopping. Great job and very inspiring. Lot;s of wonderful projects! I just love the tartan pillow and the 'cup' mugs are super cute. What wonderful projects. First, I love your mug rugs shaped like cups! What a cute idea. Your cushion is adorable and those quilts are so cute. I can see it must be hard to stop sewing! Great projects. Love your runner, the colours pop against the black. And your mugs rugs are adorable! Such a pretty quilt that will become. All so very pretty! Frances you have made so many cute things with this fabric ! Your mini is a work of art ! Great projects ! What a great collection of projects! Those mug rugs are just too cute. Wow! You got so much done and I love all of your projects. Wasn't this fabric so much fun to work with. You did a wonderful job on your projects! You were very busy! I love the mug shaped mug rugs. Beautiful work, Love that quilt top! What fun fabric to work with for this hop!! Wonderful projects! Your quilt top is beautiful! Love your projects! Are the mug rugs your own design? Love them! (I'm a tea lover too.) Thanks for sharing! Great projects and your mug rugs are sew cute! Great job on all your MANY projects! I really love that mini quilt! I love your little tea time runner! Wonderful work. I love the handles on the mug rugs. Sew many wonderful projects. I LOVE the mug rugs, so very creative. Your projects using this fabric are so sweet...I love the quilts and pillow! The pillow is gorgeous and I think those mug rugs are too stinking cute! Great projects - love the tartan with ruffles! Where on earth did you get the tape measure tea mug? Must have one of those! Thanks! Your mug rugs with proper handles and wonderful? The tartan-perfect...my favorite is tartan, especially with green. Beautiful projects and bravery in taking pictures in the snow! Thank you for sharing. I like them all. You are a creative gal. Wow, everything I see looks incredible, with these lovely ladies on them. Love the plaid you added for your pillow. Beautiful projects and I really love the quilts. You did a wonderful job. Thank you for sharing. Your mug rugs are the best I have seen. They are the only true mug rugs. Fabric is so wonderful. I love your projects! Plaid was a perfect choice for the lady and I like the mug rugs shaped like mugs. Fun projects…especially like that your mug matched your mug rugs!!! You are very talented! Thanks for sharing your projects. Your projects are fabulous using "She Who Sews". I too see Scottish Lady with Tartan. Thank you sew much for hopping. I am now a follower and will visit again. Those mug rugs are just too stinkin cute! The pillow is lovely and the quilt is nice too. I know what you mean about the quilt growing. Mine do that a lot! Excellent projects. Love the cup mug rugs. Too cute. Would love a tutorial for them. Hi, Frances - Great projects today - Sometimes quilts just make themselves, right? It grew to what it needed to be. Beautiful, fun fabrics. You just kept going and going with this fabric made lots of wonderful goodies. You really were inspired by the fabric and the panels, I can see! The wind was not helping to get an outside shot, was it and especially that cold out. The wind chills must have been horrid. Only a quilter would go through that, right? THX for sharing with us today. Hi Frances -stunning fabric, and such creativity. I love the dolls holding hands. Was this a pattern you cut out, or the print on a larger piece of fabric? your projects are absoutely stunning, love these mugrugs. Congratulations to the TOP of the day, well deserved! Beautiful work and such neat projects!! Brrr - beautiful pix in cold weather. I think you're sending the cold weather this way. We were having temps in the 60's and high in the low 20's today. I adore the mug rug - cool! Actually, all your projects are stunning. You already have a ruffle project completed - lol. I just had to go back and take another gander at all the beautiful work. Not only are the projects wonderful but also the workmanship. Thanks for participating and giving us something to be in awe of. Lots of lovely projects Frances , that is really neat fabric ! I love the tartan pillow, great details. wow! 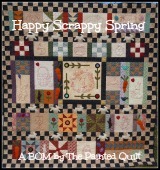 you have made some beautiful things - love all of them - especially the quilt and the cute as mug rugs - too fun! Don't you just love it outside after the storm has passed. It's always so bright and fresh. Totally a perfect way to get super pictures. I loved the little cup mug rugs. The quilt is gorgeous. This is a completely awesome fabric line! I just love each one of your projects. The handmaids panel is so cute and you really did it justice wqith what you created. Thanks for sharing. Very nice projects. You did a great job. Don't you just live the prints? Frances your projects are all really creative. Love the mug rugs. You really took off with ideas for the fabric! I think my favorite is the tartan pillow lady. Very creative. You mixed up the line beautifully. The mug rugs are priceless. I love what you made! I really enjoy the mini quilt with the sewing machine and butterfly, so far it's my favorite use of the fabrics, and is something I could totally see in my sewing room. Love, Love , Love all your creations! Fabulous and such a fun post! Lots of fun, cute projects! You have been so busy! Everything turned out beautiful! I love this line. Todos os projetos são criativos e maravilhosos.